INVITATION TAROT/NUMEROLOGY DAILY… 18… the moon. Leap day… One more day to our year. So on this final day of February, we have the Moon and the Hermit holding the ‘9’, the number of ‘pulling-it-all-together’. It is not a full moon yet, which I often consider a time to consider your ‘fullness’ and still, today brings us ‘9’ and a day or birthday year of perusing what you’ve done, maybe that’s been over the past few days, or the last weeks, months, and deciding if now is the time that completion can occur. 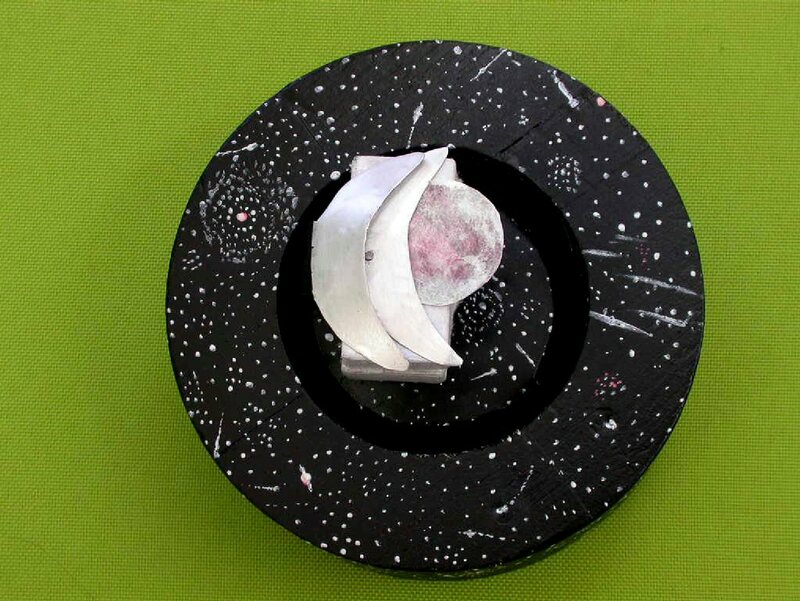 The Moon invites the cycles of life, feelings, and light related to the Sun, the Earth, and the Moon. LIght of any kind can produce shadow and there are times resting in the shadows is a wise time. A waiting time to come into your fullness. The Hermit expresses his/her ‘9ness’ by gathering her Wisdom, feeling it fill her up and then lighting a Path to that Wisdom for other’s to see. Some people are a joyful expression of life and reflect it out into the world. I think of those as ‘Hermit kind of people’ Their light shines and we feel attracted to it. We want some of it. Hopefully, it becomes clear that their reflection is an opportunity to realize our own Light and Wisdom; our own joy. What pattern gets in your way of finishing and what might you do to shift that? What if…;there is no completion for something and it’s time to move along and give it up? Todays invitation, should it be your birthday or stepping into the day with the desire to explore some questions, is all about the number ‘9’ , the Hermit, and the Moon. ‘9’ is the number of completion, pulling together those last final pieces of what you have been working on for some time now. The Moon, speaks to cycles, the flow of feelings and thoughts that provoke those feelings, the shadows of life, how you reflect light, and the fullness of that radiance. 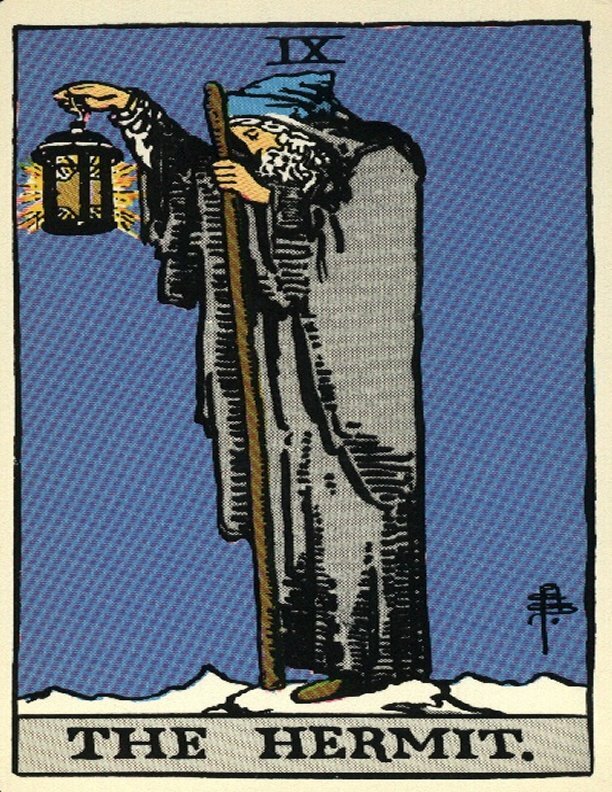 The Hermit, calls to your inner wisdom, lights it up and lets it shine within and out. He/she invites you to pay attention to what you know and how you might expand on that spiritually. What ‘pieces’ of your puzzle are now ready to be laid on the altar of your life complete? As you rest in the ‘shadows’, gathering quiet and peace, what calls you to come out in the light? What do you notice about the cycles and patterns of your life? What works and what doesn’t? Do you have a pattern in your life you’d like to change and shine more light on? Did you know that you have as much time as you need? Is there something in your life that feels incomplete? What would work for you to bring completion? Please make a visit to my Poetry Blog… http://geezergirl.org . I share my poetry everyday there.